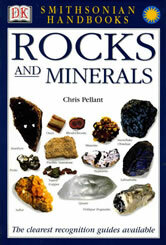 Learn about rocks and minerals with these great books! We have a nice selection of over 50 books to choose from - there's something for everyone, from the amateur rockhound to the professional geologist. Please browse our selection below. We also have separate sections for the Roadside Geology series and books about Gemstones, Fossils, Finding Gold, and General Geology. An introduction to fluorescent minerals, types of fluorescence, collecting methods and localities, light sources, hundreds of breathtaking photos in both daylight and UV light! More information, table of contents. An introduction to fluorescent minerals, types of fluorescence, light sources, activators, extensive identification guide with photos, how to find fluorescent minerals and much more. This book is a 8 1/2" x 11" paperback with 192 pages. More information, table of contents. "A comprehensive illustrated guide to the forms, physical properties, classification and study of minerals from around the world. More than 400 photos, tables, charts, glossary, bibliography and informative descriptions of 288 minerals." More information, table of contents. Information on over 500 minerals, complete with detailed color photographs, crystallographic diagrams, physical and chemical properties, and much more. More information, table of contents. A practical directory of over 150 igneous, sedimentary and metamorphic rocks. Great for beginners or experienced. A 7" x 9" hardcover with 128 pages. More information, table of contents. A great book for reading or reference, this handy (6.0" x 8.5") handbook by Chris Pellant presents interesting facts with full-color photos of hundreds of different rocks and minerals. Contains 256 pages, a glossary, identification guides and index. More information, table of contents. An authoritative and practical identification and reference guide to minerals, rocks and fossils. Hundreds of color photos. The 5" x 7 1/2" size is great for your field bag. More information, table of contents. A handbook that explains rock, mineral and gem identification along with a huge reference section with hundreds of photos. Great for beginners or experienced. A 5" x 7 1/2" paperback with 381 pages. More information, table of contents. A great book for reading, reference or exploring. This textbook-size (7" x 9.25") guidebook by Ronald Louis Bonewitz presents interesting facts about hundreds of different rocks, gems, minerals and fossils. Contains 360 pages with hundreds of full-color illustrations and index. This book is REALLY nice! More information, table of contents. An introduction to minerals with photos and descriptions designed to aid you in field or at home study. A comprehensive reference with hundreds of photos. Durable plastic covers. 4" x 7 3/4", 856 pages. More information, table of contents. An introduction to rocks and minerals with detailed photos, description and identification information. Sponsored by the National Audubon Society, the National Wildlife Federation, and the Roger Tory Peterson Institute. This book is a 4 1/2" x 7 1/4" paperback with 401 pages. More information, table of contents. by Annibale Mottana, Rodolfo Crespi and Giuseppe Liborio. Edited by Martin Prinz, George Harlow and Joseph Peters, The American Museum of Natural History. "An easy-to-use field guide, with more than 1,000 spectacular illustrations - 600 in full color." More information, table of contents. What are geodes? How do they form? Where can they be found? How to open them and collect them. Heavily illustrated with beautiful specimens. This book is a 7" x 9" paperback with 292 pages. More information, table of contents. A beautifully illustrated book that will help you learn all about agates, their properties, famous agate localities around the world and more. This book is a 6 1/4" x 8 1/2" hardcover with 184 pages. More information, table of contents. Agates Inside Out is a wonderful book that introduces you to the world of agates with lots of great photos, charts and diagrams. Written so that almost anyone with an interest can learn. This book is a 6" x 9" paperback with 246 pages. More information, table of contents. "The introductory guide to the basics of geology and to collecting and identifying rocks." Loaded with illustrations and full-color diagrams, photos, pictures, and sketches. Discover what Earth science is all about with this popular book! More information, table of contents. A directory to fee-mining for rocks, minerals, fossils, gold and treasure in the western U.S. Rockhounding sites, caves, gold prospecting, mines, festivals, museums, and more. More information, table of contents. A directory to fee-mining for rocks, minerals, fossils, gold and treasure in the eastern U.S. Mineral sites, caves, gold prospecting, mines, festivals, museums, and more. More information, table of contents. Where and How to Dig, Pan and Mine Your Own Gems and Minerals: Volume 1: Northwest States. More information, table of contents. Where and How to Dig, Pan and Mine Your Own Gems and Minerals: Volume 2: Southwest States. More information, table of contents. Where and How to Dig, Pan and Mine Your Own Gems and Minerals: Volume 3: Southeast States. More information, table of contents. Where and How to Dig, Pan and Mine Your Own Gems and Minerals: Volume 4: Northeast States. More information, table of contents. An introduction to rockhounding with basic geology, mineral and fossil identification, color photos, field methods and much more. Revised, expanded second edition. This book is a 6" x 9" paperback with 304 pages. More information, table of contents. A field guide to some of the state's best rockhounding sites! A 6" x 9" paperback with 221 pages of descriptions, maps, and photos. More information, table of contents. A field guide to some of the state's best rockhounding sites! A 6" x 9" paperback with 219 pages of descriptions, maps, and photos. Second edition. More information, table of contents. A field guide to some of the state's best rockhounding sites! This book is a 6" x 9" paperback with 190 pages of descriptions, maps, and photos. More information, table of contents. A field guide to some of the state's best rockhounding sites! Second edition. This book is a 6" x 9" paperback with 244 pages of descriptions, maps, and photos. More information, table of contents. A field guide to some of the region's best rockhounding sites! This book is a 6" x 9" paperback with 244 pages of descriptions, maps, and photos. More information, table of contents. A field guide to some of the state's best rockhounding sites! This book is a 6" x 9" paperback with 254 pages of descriptions, maps, and photos. More information, table of contents. A field guide to some of the state's best rockhounding sites! Second edition. This book is a 6" x 9" paperback with 220 pages of descriptions, maps, and photos. More information, table of contents. A field guide to some of the region's best rockhounding sites! This book is a 6" x 9" paperback with 312 pages of descriptions, maps, and photos. More information, table of contents. A field guide to some of the state's best rockhounding sites! This book is a 6" x 9" paperback with 260 pages of descriptions, maps, and photos. More information, table of contents. A field guide to some of the New York's best rockhounding sites! This book is a 6" x 9" paperback with 277 pages of descriptions, maps, and photos. More information, table of contents. A field guide to some of the state's best rockhounding sites! This book is a 6" x 9" paperback with 156 pages of descriptions, maps, and photos. More information, table of contents. A field guide to some of the states' best rockhounding sites! This book is a 6" x 9" paperback with 277 pages of descriptions, maps, and photos. More information, table of contents. A field guide to some of the state's best rockhounding sites! This book is a 6" x 9" paperback with 180 pages of descriptions, maps, and photos. More information, table of contents. A field guide to some of the state's best rockhounding sites! This book is a 6" x 9" paperback with 158 pages of descriptions, maps, and photos. More information, table of contents. Visit the places where experienced rock and mineral collectors have found success! Detailed descriptions, photos and maps guide you to some of the best gem collecting sites in the state. More information, table of contents. Visit the places where experienced rock and mineral collectors have found success! Detailed descriptions, photos and maps guide you to some of the best gem collecting sites in Idaho and western Montana. More information, table of contents. Visit the places where experienced rock and mineral collectors have found success! Details on over 75 collecting sites, each with a map, directions, and GPS coordinates. More information, table of contents.